Located two and a half hours drive from Sydney, one hour beyond Katoomba, Casey's Farm House is just ten minutes from the township of Oberon. Sleeps up to 12 guest, with 7 beds in 5 bedrooms. The farm house is fully self-contained with well equipped kitchen, long dining table seating 14 guests, 3 bathrooms, 2 spacious living areas all decked out with comfortable modern furniture. With plenty of outdoor sports equipment, an outdoor play shed with table tennis & pool table, dart board, cricket set, footballs and a great collection of quality reading books and numerous board games for the snowy / rainy days. Blankets, pillows and pillowcases are provided. Kitchen is fully stocked with cookware and utensils. Our family farm house has breathtaking panoramic views across the Tarana Valley to Evans Crown and splendid Central Tableland and is reasonable prices for larger families, situated just north of Oberon. Oberon features restaurants, shops, tennis courts, heated swimming pool, a challenging 18 hole golf course overlooking Lake Oberon and Mayfield Gardens, one of the largest privately owned cool-climate gardens in the world. 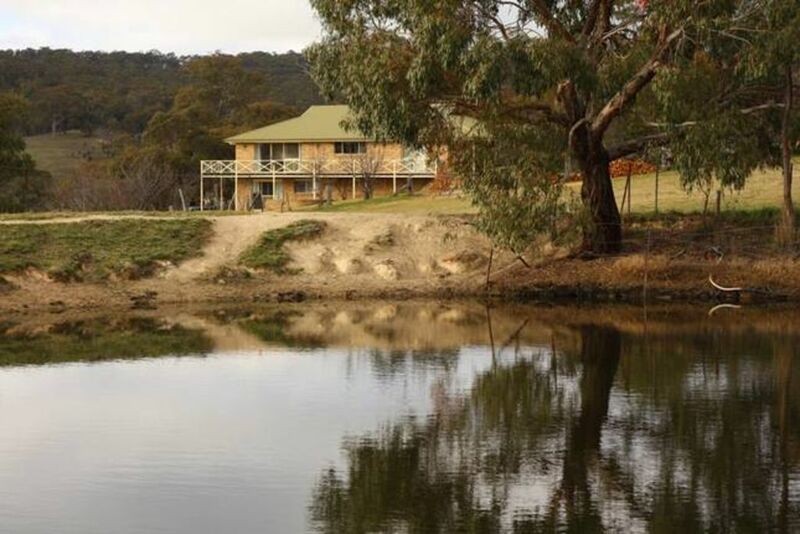 The farm house is just 45 minutes from Jenolan Caves /Blue Mountains and the Bathurst 1000 Car Races. Experience all four seasons in Tarana Valley, a temperate twilight in summer, sensational snow in winter, the crisp colour of autumn and the green growth of spring. At 1000 metres above sea level in true mountain climate,including annual snowfalls! Nearby attractions include Casey's Winery, Evan's Crown, Mayfield Gardens, Tarana & O'Connell Hotel, Mount Panorama, Bathurst, Lake Lyal, Lithgow, Oberon Dam, Fish River, Jenolan Caves, Kanangra Boyd National Park and Abercrombie Caves. Further afield, 2.5-3 hours scenic drive, you will find the wine regions of Orange, Cowra & Mudgee which together form the Central Ranges zone of NSW. Modern fully equipped family farm house nestled amongst rare Australian Eucalypts & Flowering Gum Trees. Accommodates up to 12 people. The farm house has 5 spacious bedrooms, 3 Bathrooms, 4 Living Areas -[Kitchen/Dining/Lounge x2]. The open plan living / dining area has a custom made dining table seating for 14 guest, modern timber kitchen and leather lounges in living areas. Doonas, pillows & pillowcases are provided, bed linen can be provided for a small fee, and a portable cot is available. All bedrooms have central heating. This family farm house was designed to entertain large family groups so that they can enjoy the relaxing country valley views in the comfort of a modern woodfire central heated house or from relaxing leafy gardens. Lovely location, well appointed house with plenty of space and things to do. Thank you for your feed back Andrew. We glad you all enjoyed the farm house. You most welcome back any time. Casey's farmhouse is a very spacious five bedroom home, with great facilities and a beautiful setting. We came for a family wedding and would recommend it highly for anyone looking for a country family holiday. P.S. The shed is full of great games etc for big and little kids. An issue was fixed very quickly which we appreciated. Thank you for taking the time to submit your review, much appreciated. We are very pleased to hear another family group have enjoyed our family farmhouse and made use of the play shed equipment. We welcome your family back anytime. Our group was pleasantly surprised to be welcomed by the smell of the fireplace being put on for us, a warm and pleasant surprise. Plenty of space for us to have our own area to relax in and bedrooms were lovely. Peaceful surroundings and great set up in the garage to unwind and flying fox was great fun, not only for the kids but adults too. Thankyou for a very enjoyable stay. Thank you for you looking after our farm house and for your positive review. It is so nice to hear from our guests and pleasing to know we are providing a service that meets all your needs 😁🤗 hope to see you all again. Would definitely come back to this house. Its got everything you need, well presented and nice location. The zip line was a source of fun and the games is great for the kids. The house is large and would easily fit 2-3 families with plenty to do. Amazing views. The kids had a blast playing on the farm. Amazing views, peaceful and lots of activities for the kids. Kids had fun on the flying fox, playing ping pong and feeding the cows.